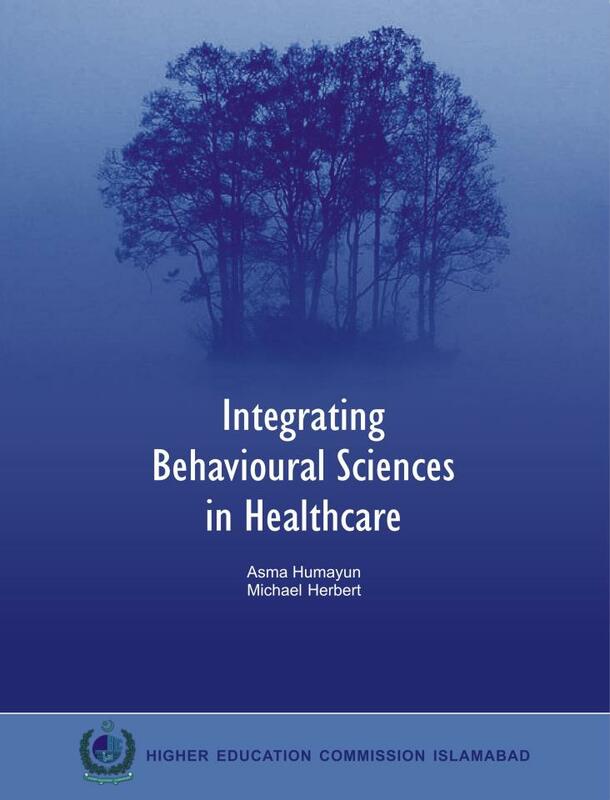 This is a textbook of Behavioural Sciences, which covers nearly all areas related to behavioural medicine required to develop knowledge, attitudes and skills for a holistic approach. It sets guidelines for the trainers based on an extensively researched literature. Complete references are provided for further reading. It was first published by the Higher Education Commission, Pakistan, in 2010 and was recommended for both undergraduate & postgraduate medical training. The book was reprinted in 2011 and is available in all major cities. It is presented in just over 300 pages, in a reader friendly colour format, on high quality matt paper. "an emerging growth from an accepted idea"
All over the world, the medical profession faces ever growing concerns about improving the efficiency of doctors, restraining expenses and enhancing the quality of healthcare. Some believe that implementing evidence-based medical practice or pouring in more resources are the solutions. However, that might not be enough. Even resource rich and scientifically developed heath care systems are not up to scratch. there is need to change the approach of doctors to include a better understanding of behavioural issues. Despite many years of effort, the subject of Behavioural Sciences is still very new for medical institutions in Pakistan. The extent of formal integration of the subject into medical curricula varies greatly across different medical universities. But almost all institutions recognise the need to do so. A major hurdle is a dearth of trainers and training material. Not many doctors understand the nature and scope of the subject. Not much literature is available in the local market. Large texts of psychology or sociology are indeed available but they have little direct application for medical students. It is undoubtedly true that communication lies at the heart of medical practice. Without adequate communication skills, practitioners would be at a loss as to how to deal with the sick people who come to see them. The emphasis in the preceding sentence lies on the word ‘adequate’. Just because we have a mouth that works, ears that can hear and eyes that can see does not mean that we are any good at communicating. The trouble is that many medical practitioners assume that these sensory faculties are, indeed, all that are needed to deal with patients and their families. 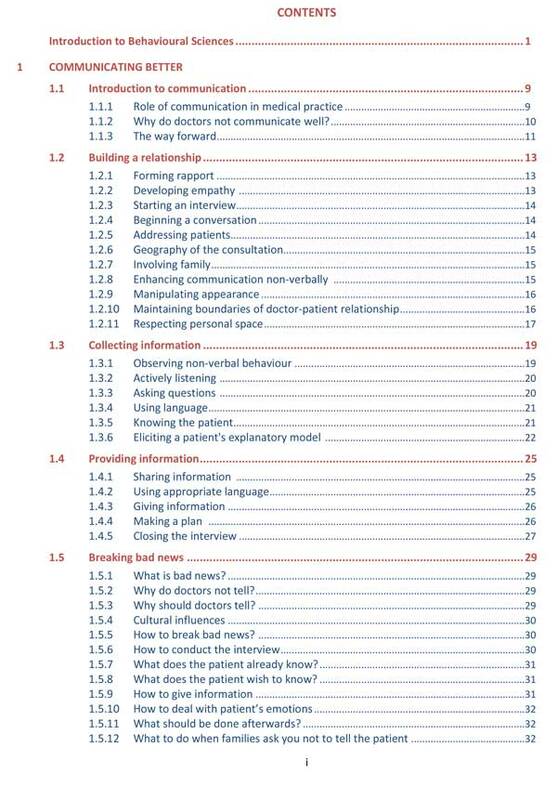 After looking at the importance of communication skills in medicine in chapter 1.1, we move on in subsequent chapters (1.2, 1.3 & 1.4) to examine the ‘building blocks’ used in constructing effective communication with patients. These involve the skills of developing a relationship, collecting information and giving information. While we examine these individually in some detail, we must remember that eventually they all have to be welded together into a seamless whole. The only way to do that is to practice repeatedly, monitor one’s own performance and constantly question how we might do it better next time. Given that time and effort, we stand a good chance of becoming an effective and humane doctor. We then turn our attention to an area of medical practice that many doctors dread. What if the patient’s illness is incurable? What if the illness is a terminal one? How do I tell the patient or, indeed, should I tell the patient? What if the patient reacts in a way I don’t know how to deal with? In the middle of all the TV programmes we have where medicine is portrayed as dealing with mysterious symptoms which are eventually solved to the eternal gratitude of the patient and admiring support staff, this is the reality we have to face. Nobody lives forever. We have to deal with that fact. Chapter 1.5 gives some suggestions about how to do that. Finally, we discuss the ways in which doctors in many specialties, not just psychiatry, can help patients who are suffering psychological distress (chapter 1.6). Such distress is common in almost all areas of medical practice covering, but not limited to, pediatrics, obstetrics, cardiology, endocrinology and geriatrics. We insist that it is not the job of the doctor to walk away from these reactions by patients. We can help. Humans are born with precious few, but not totally absent, innate abilities. But in a relatively few years we develop quite advanced skills which eventually allow most of us to function as competent adults. This section looks first at the early years of life and traces what abilities we do possess from the start, including how we learn to think logically (chapter 2.1). We then move to a discussion of the years, sometimes seen to be ‘difficult’, covering puberty and adolescence and how a doctor needs to be able to cope with patients at this time (chapter 2.2). 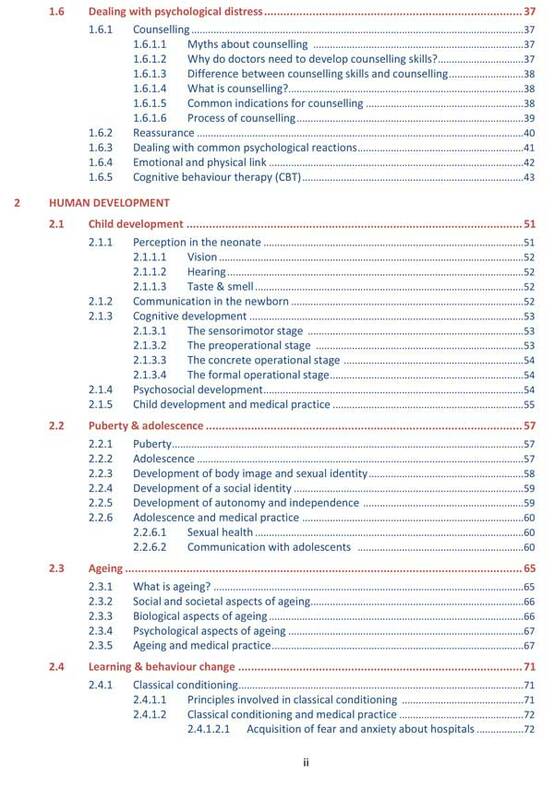 Chapter 2.3 then looks at the particular requirements that older people have. It does so from the biopsychosocial perspective that we discussed in the general introduction. After that, we shift emphasis towards looking at the basic psychological characteristics that people have. 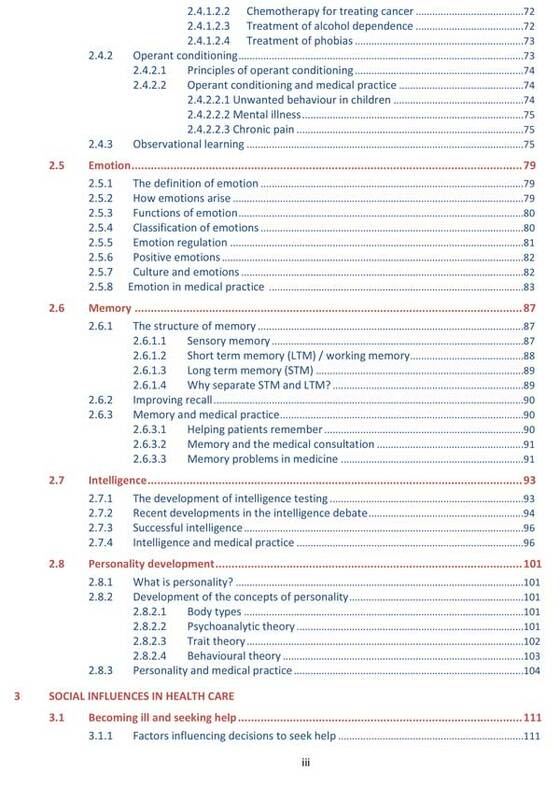 These include how we learn new behaviours (chapter 2.4); emotional aspects, but not just from a negative viewpoint (chapter 2.5); how memory works (chapter 2.6); the nature and relevance of intelligence (chapter 2.7) and finally we touch on personality (chapter 2.8). In all of the chapters in this section, we have made deliberate attempts to demonstrate that the concepts we discuss are not just based on intellectual curiosity, but that they do have relevance to the everyday practice of medicine. Since doctors are very often asked for their opinions about behaviour, we feel that, rather than relying on ‘commonsense’ (whatever that means), a basic outline of people’s abilities is an important part of medical education. Much of current medical practice, and therefore medical education, adopts a disease-centred, biomedical approach. As a result, many students regard learning about the social aspects of practice as being a bit of a nuisance. We think that it is less of a nuisance then having to learn about fuctional neuroanatomy when someone is determined to become an orthopaedic surgeon. In fact, we maintain that no matter which branch of medicine you intend to specialise in, a major part of your practice will involve precisely these social factors. That is what we concentrate on in this section. We start (3.1) by looking at what determines whether or where ill people seek help and why you should know about that. Then, in 3.2 we look at the importance of psychological stress in causing illness as well as the role of stress in a doctor’s life. People come for help bringing with them a whole set of beliefs and expectations with them. Doctors need to know about those ideas because, if the patient’s assumptions are unexplored but are held strongly, you will not be able to discuss or modify them (3.3). That, in turn, will probably result in patients not following your advice. That is covered in 3.4. Patients do not sit passively when they develop symptoms. They respond to them in a variety of ways. Those include developing coping strategies and you as one of their carers need to be able to help in that. Section 3.5 deals with that. An important, fundamental and integral part of the patient’s life is the role played by the family. Illness affects family functioning and the family affects health. If you don’t know about that and therefore don’t ask, the value of your advice can be severely undermined. We discuss this in 3.6. One of the responsibilities of medical practitioners is a duty to ensure that all patients are treated equally and that facilities which allow that should be in place. Unfortunately that is usually not the case. There are large groups of people who have inadequate health-care, but deserve better. These include poor people, women and the mentally ill. Section 3.7 outlines this issue. There are some areas of medical practice that seem to less ‘popular’ than others. This may be because they are seen to be ‘difficult’ areas in which to work and therefore they receive less attention in terms of both research and medical education. It is some of these areas which we discuss in this section. We start (4.1) by looking at how our behaviour affects general health. Eating inadequately or drinking alcohol, smoking or taking drugs are all forms of behaviour which have an effect on our health. We examine how these might come about and how doctors can help. Coronary heart disease is not an underexplored area but it is one in which in which behavioural causes of it and psychological reactions to it are frequently and unfortunately ignored by many health professionals. 4.2 looks at these areas in more detail. Medical practice tries hard to derive theories and hypotheses to explain the symptoms that patients display or complain of. So when we can’t find an explanation we often feel that we have failed. But medically unexplained symptoms are quite common and we may have to try another approach to understand them. That is what 4.3 does. 100% of people die. They do so often in great discomfort and pain. As carers we have a duty to help as much as we can, but all too often we avoid the difficulties of dealing with the patient and their family. That is regrettable and ways of approaching the issue are discussed in 4.4. Dealing with sexual problems of patients is another area which causes many doctors to shy away. 4.5 deals with what kind of problems can arise and the potential difficulties in discussing them which face the patient and doctor and how we might overcome them. Many doctors might feel that they are well-equipped to deal with physical trauma or injury. But are we equipped to deal with the psychological consequences? And what if the trauma arises from domestic violence? Are we able and willing to deal with that? Probably not. 4.6 tries to help us do so. But it also introduces two other areas which are rarely discussed in general medical textbooks. The first area provides details of the extent, types and consequences of torture and the second area discusses deliberate self-harm, which is more widespread than is commonly realised. Pain is a symptom of central importance in medical practice. But rather than just dishing out analgesics or giving anaesthetics, we need to understand that, in fact, pain is a very complex concept. 4.7 discusses behavioural factors that influence the perception of pain and more recent theories about what pain is. That helps us deliver more effective therapy. 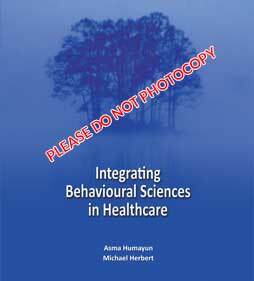 Very few books dealing with the application of behavioural principles to medical practice include the topic of ethics. This is both surprising and worrying. It is surprising because medical ethics, which deals with how we should or should not interact with patients and colleagues, lies at the heart of daily clinical practice. It is worrying because if doctors are not taught to think about their ethical responsibilities, then there is little curb on an assumed right to do whatever they want. This section attempts to redress that educational imbalance. 5.1 gives an overview of what medical ethics is about and how it applies not just to qualified physicians but also to medical students. After that (5.2), we discuss in some detail the four basic principles governing ethical clinical practice. 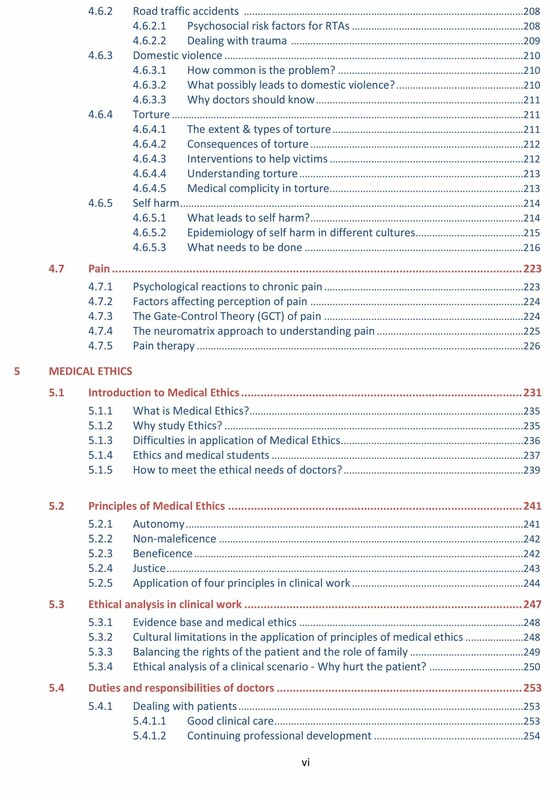 Chapter 5.3 looks at some specific aspects of an ethical analysis in clinical work and chapter 5.4 examines what duties and responsibilities doctors have. That includes not just dealing with patients and colleagues, but also research, financial matters and drug companies. Ethical conflicts are not uncommon in clinical life. Chapter 5.5 looks at some specific examples. 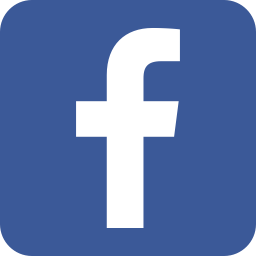 Readers are asked to think about how they themselves would deal with such situations and to examine the basis on which they would act. Finally, in 5.6, we look at the particular ethical issues underlying whether it is right or wrong to allow people to sell one of their kidneys. This is a major problem in Pakistan and south Asia. Before reading this chapter, we advise you to work out your own position on this issue and then to see whether that position has changed after you finish the chapter. Mental health problems are enormous in most countries. They are responsible for much misery to patients, their families and to society and carry large economic consequences. Many people including, unfortunately, many doctors are unaware of the signs and symptoms of mental disorders and what to do about them. That is what this section mainly concentrates on. We are not trying to turn readers into psychiatrists but, since there are not enough mental health specialists in Pakistan, we do advocate that all doctors, especially those in primary care, should have a greater awareness of these problems and a basic knowledge of how to address them. Without that, the very wide gap between the need for mental health care and delivery of it will not be filled. 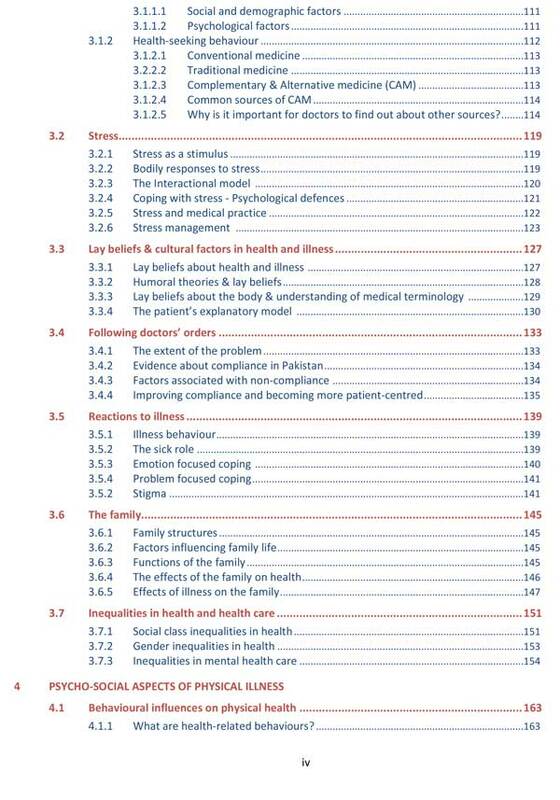 Chapter 1.1 examines the burden imposed by mental health problems and the prevalence of such disorders in Pakistan. 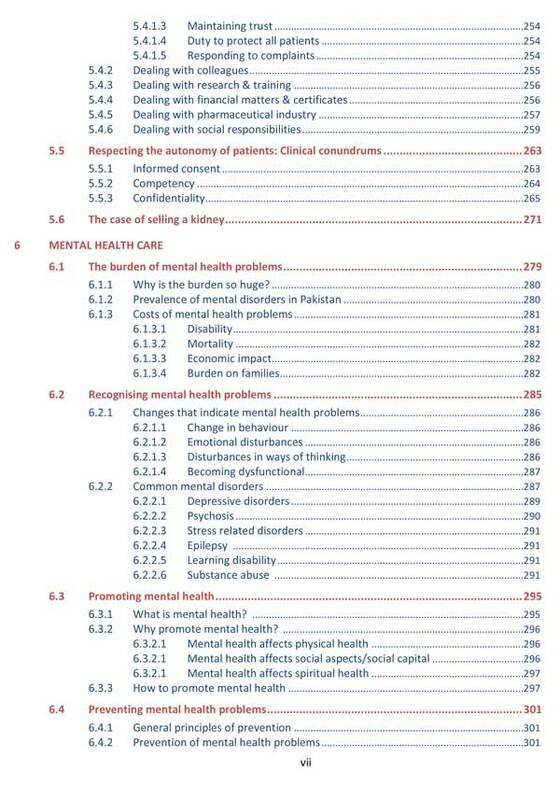 Costs of mental health problems include disability, mortality, economics and familial interference. This chapter looks at those. Of course, if we don’t recognise mental health problems in the first place, then there is little chance that we will deal with them. 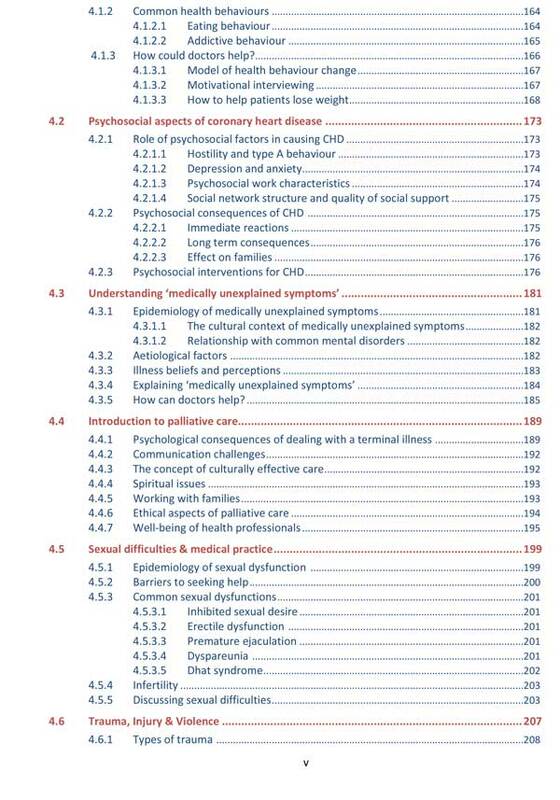 So chapter 6.2 points out what we should be looking for as well as giving a brief overview of common mental disorders. Much work these days concentrates on health promotion to avoid physical illness. 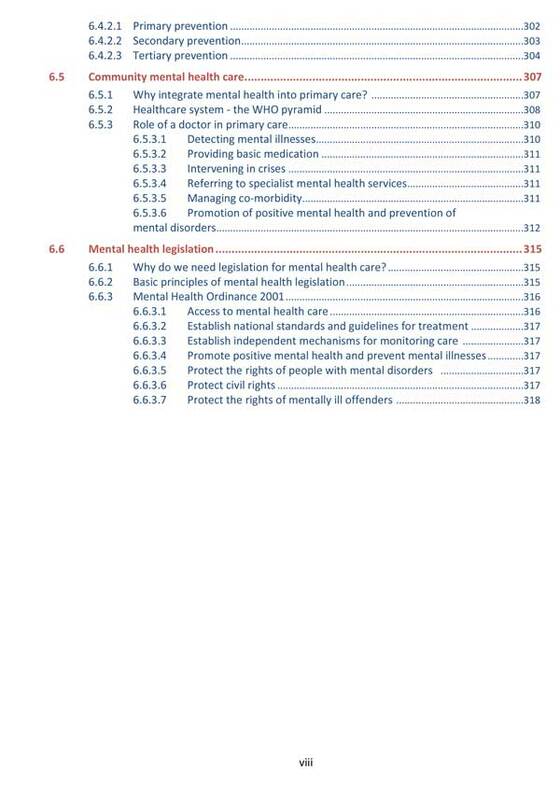 Mental health is no different and chapter 6.3 looks at that while chapter 6.4 focusses on the prevention of mental problems. There is a marked lack of psychiatrists in Pakistan so effective mental health care has to be delivered by other health-care workers, particularly those in primary care. Suggestions as to how that can be brought about and when to refer for specialist help are covered in 6.5. All doctors have a duty to be familiar with the legal requirements governing medical practice. This is particularly true when it comes to mental health legislation. For too long the treatment of psychiatric patients and a denial of their basic human rights was a disgraceful part of medical practice. All doctors must be aware of what can and cannot be done, under the law, to protect people with mental illnesses. Our final chapter (6.6) describes those. In the recent years Pakistan is plagued by a deep sense of mistrust and anger against the medical profession. This is mainly due to poor doctor patient relationship, for model healthcare used by the doctor, lack of adherent to principles of medical ethics, communication skills, counseling by the doctors, awareness of the psychological, anthropological, social and cultural aspects health and disease and the peculiar needs of patients suffering from various diseases. It is the lack of understanding and training in these very areas on the part of the doctor that leaves him in tangles and wrong-footed in his interaction with patients, their families and the societal institutions such as media, police, judiciary and bureaucracy, unfortunately, the traditional curricula of undergraduate and postgraduate education and training of doctors as well as the exponents of these curricula, till late have been oblivious of these crucial aspects of a standard medical syllabus. The book fills an important void in the teaching of behavioral sciences in Pakistan & the region. The book will be of great use for both under and postgraduate medical and psychiatric training in Pakistan, particularly as behavioral sciences has now been introduced as a subject in the curriculum of many medical colleges. I am impressed by the contents, areas covered and its succinct & clear language. This book will fill a wide gap between “mind and body” and it should be must reading for all postgraduate students, irrespective of their speciality. “Integrating Behavioural Sciences in Healthcare” should be taken seriously by teachers and students as it will raise the ethical practice of medicine in Pakistan. It is a truly magnificent effort. This book is beautifully written and is quite comprehensive, not just for undergraduate students but also for postgraduate doctors.